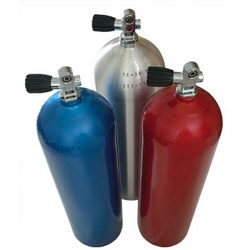 The cylinders that we use which give us our air supply come in two major materials--aluminum and steel. Most dive resorts use aluminum tanks because they are less expensive than steel tanks; however, steel tanks hold more cubic feet of air than that of an aluminun of the same size. Steel tanks also are less buoyant in water so you can wear less weight. Between an aluminum 80 and a steel 80 you may wear 5lbs. less weight with the steel tank. Here at Dolphin we have a large selection of tanks. We have aluminum tanks made by Catalina and Luxfer in sizes from 6 cu ft to 80 cu ft. Our steel cylinders are manufactured at Worthington Cylinders state of the art facility in Tilbury, Canada. The cylinders are manufactured using the Deep Draw and Ironing (DDI) process. The cylinders start from a plate of chrome-moly steel. Multiple draws on the hydraulic press transform the threads are machined. The DDI process produces the most consistence wall thickness resulting in the lightest weight, most efficient cylinders. This manufacturing process is what allows us to supply cylinders with the best buoyancy characteristics for scuba diving. The cylinders are Hot Dip Galvanized and have a Life Time exterior rust GUARANTEE. If the exterior of the steel cylinder rusts we'll correct it for as long as you own the cylinder.